Guest of Honour, Singapore's Prime Minister Lee Hsien Loong, launching the permanent logo of the WCEC together with representatives of the Founder Members Board during Opening Ceremony of the 11th WCEC on October 5 2011. From left: Teo Siong Seng, President of SCCCI; Guest of Honour PM Lee Hsien Loong; Jonathan Choi, Chairman of The Chinese General Chamber of Commerce, Hong Kong; and Suthee Meanchainun, President of the Thai-Chinese Chamber of Commerce. The design concept of the logo is based on a globe, and paints a vision of Chinese Entrepreneurs from various parts of the world who get together with a common sense of unity and purpose. 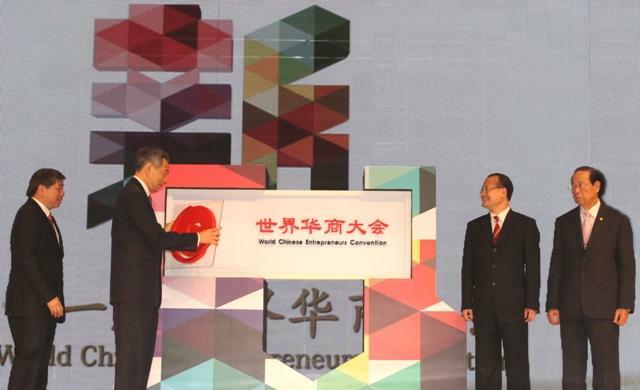 The logo visibly encompasses the acronym of WCEC – “World Chinese Entrepreneurs Convention”. The globe in the design signifies “World”. The external C represents “Chinese” all over the world. The “E” in the middle stands for “Entrepreneurs” while the small “C” at the centre stands for “Convention”. The opening in the “E” shows how Chinese entrepreneurs from all over the world are drawn together to network and share experiences at the convention to achieve its intended purposes. A vibrant and deep red, an auspicious colour in traditional Chinese customs, is used as the main colour for the logo.